Leon plays with an awe-provoking optical effect that underlies its salient feature, that is, a standpoint-dependent visualization. From the front, the doors appear marked by vertical multi-coloured stripes yet, when observed from the side, dark or light uniformity prevails. Even the unique lacquered white finish produces the same effects through room lighting. 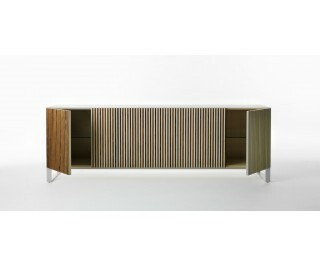 Structure made from particleboard, either veneered and stained or melamine-coated and lacquered. The thickness of the structure and shelves is 18 mm, the back panel 10 mm, and the fixed central divider 36 mm. Doors with triangular section inserts made from stained or lacquered beech. In the white lacquered version, doors in shaped MDF. Shelves made from transparent tempered glass, with polished edge, 5 mm thick. PVC or felt bumpers. Painted ABS adjustable feet with aluminium finish. Optional base, height 16 cm or 32 cm, made from powder-coated iron.